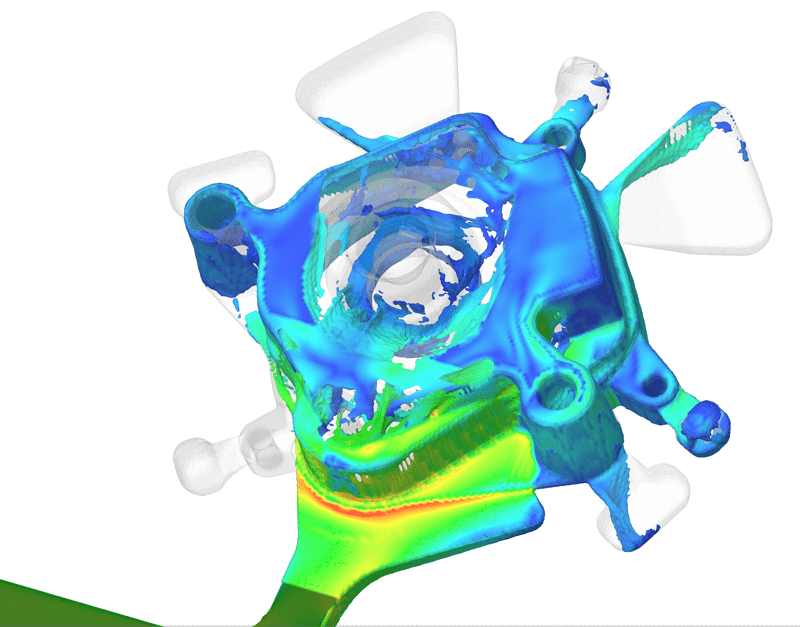 High Pressure Die Casting (HPDC) presents some of the biggest challenges for casting simulation software. 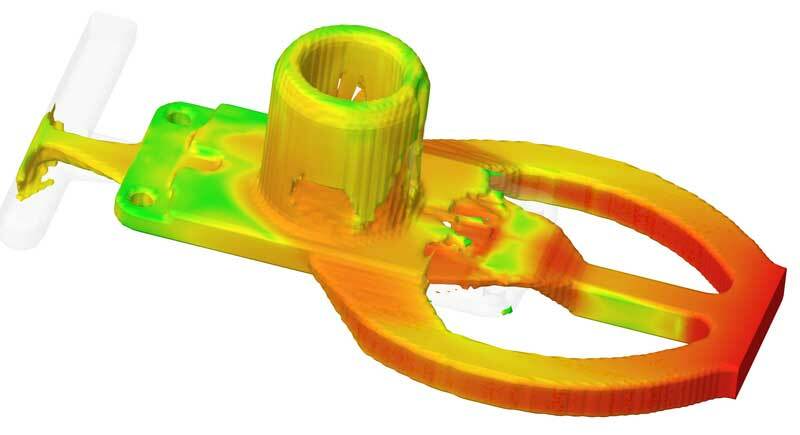 FLOW-3D CAST has several features that substantially improve the accuracy of a die filling simulation enabling the user to critically analyze the filling process, including its highly-accurate TruVOF algorithm for tracking moving metal fronts and the FAVOR™ method to accurately represent the complex geometries typically involved in high pressure die casting. Plus, FLOW-3D CAST has numerous models for detecting areas of defects like entrained air, thermal stress, microporosity and fold and inclusions. 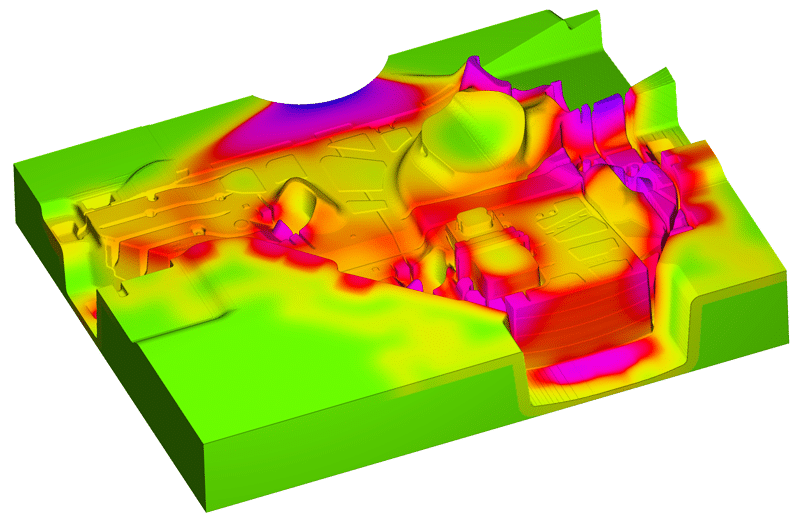 Thermal die cycling simulations are essential for high pressure die casting since the same die is used repeatedly to produce thousands of castings. Maintaining consistent die temperature due to warping in the die pieces, leading to dimensional instabilities. With FLOW-3D CAST, the temperature distributions resulted from the combined effects of die heating, spraying and air blow-off, and the location of cooling channels and inserts can be accurately and efficiently predicted. In high pressure die casting, a shot cylinder rapidly pushes the liquid metal into a die. Oriented horizontally, the metal is poured into it through a fill hole on the top and a piston pushes the metal down the cylinder. The goal of a properly designed shot sleeve profile is to push the metal into the die as fast as possible to avoid premature solidification causing incomplete or defective filling. However, if the piston moves too fast, the liquid metal will fold over, trapping air that may appear as internal defects in the final cast part. FLOW-3D CAST can be used to study different shot profiles in a few minutes of computational time. This simulation of two shot profiles shows a constant velocity two stage process and another computed within FLOW-3D CAST as gradual acceleration data that show significantly different outcomes. Courtesy of Simulated Engineering, Inc. The most complex high pressure die casting challenge is accurately tracking metal as it enters the die cavity under high pressure and at speed. The resulting splashing of the metal throughout the cavity presentsa significant challenge to prediction of defects for any software. Using our TruVOF method, we can determine the location of gates to ensure they have the best flow pattern, the location of overflows to ensure the defects flow to them, and the presence of early solidification. FLOW-3D CAST helps engineers investigate the formation of internal porosity that can affect the quality of the final part. Also, FLOW-3D CAST enables the investigation of segregation in binary alloys. Finally, a detailed temperature history helps determine whether chills or cooling lines need to be added or modified, and whether the initial metal temperature should be changed. FLOW-3D CAST enables engineers to investigate the formation of internal porosities, thermally induced stresses, and segregation in binary alloys. I have personally modeled the filling, solidification, and cooling of countless castings, with the goal being to maximize metal cleanliness and soundness, and to control grain structure, segregation and stress related defects. 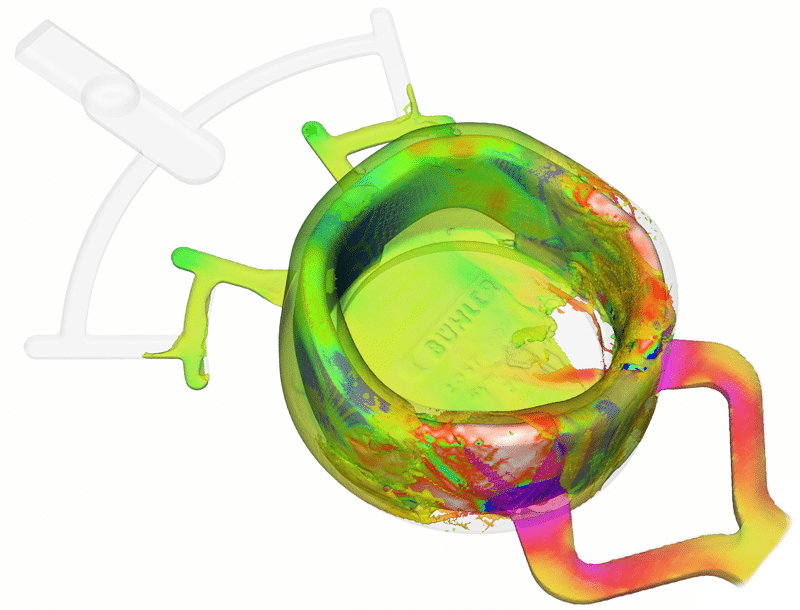 We have had a great deal of success using FLOW-3D to predict casting performance, to optimize quality, and to reduce cost by reducing rework, scrap, and lead-time.